Mon Dieu, j'ai soixante-dix ans! Three years ago, after practicing medicine for over four decades, I retired to a little town in Provence. It's great living in glorious countryside among the French in what the local tourist office describes as "un climat tonique". 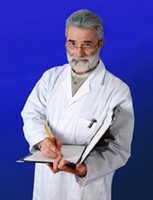 The other day I visited my local doctor to discuss the results of a series of routine tests; I was in good spirits, I'd peeked at them and they were all as good as normal, especially for one who likes to indulge year-round in the local delights. "Eh bien", said he, "Your liver functions are a little aggressif, your blood sugar is still normal but rising, you have gained five kilos since you came here." Alas, he was right. "But", he went on, "you are only seventy, you are not eighty, you are not old, do something about it, you know what to do!" Too right, I'd been preaching the same message for years and I left his "cabinet" with those sweet words, "you are only seventy, you're not old", ringing in my ears. And it's true, these days seventy is not old. It's not the time to sit by the fire with your feet up, it's the time to look to the future, the time to develop a my-god-I'm-seventy strategy. Obvious, follow the doctor's advice, lose a bit of weight, take some exercise and reduce the, how did he put it… "alimentation excessif". Keep reading and take action on all the news about life-prolonging things, like: aspirin reduces the incidence of heart attacks, cancers of the mouth, oesophagus and colon, so take a small dose daily; fibre reduces risk of colon cancer so start the day with a bowl of high-fibre cereal; drink coffee, they say it helps prevent cirrhosis of the liver (does this mean I can up the intake of Côtes du Rhone?) 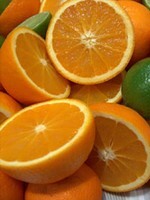 and eating an orange or tangerine once a day is said to diminish the risk of lung cancer by 30%. "Ingrédients pour la vie prolongée." Keep the brain active. A recent study in New York showed that elderly people who stimulated their brains were up to 75% less likely to develop Alzheimer's. Do crosswords, learn a language, develop new hobbies and above all socialize. Keep cheerful! Another recent study has shown that the part of the brain concerned with happiness can stimulate the immune system to work harder. People who are depressed get more colds, colds lead to bronchitis, and worse. Part of keeping happy is to have plenty of friends, this means effort on your part to make new ones and keep old ones. Happiness is also helped along by being of service to others. The father of a friend of mine at the age of ninety was delivering meals-on-wheels to youngsters of seventy; he died recently, a year short of his century. Make your house as accident-proof as possible. Avoid ladders, stepladders, loose carpets, ill-fitting footwear, poor illumination, have a fire extinguisher in the kitchen, make sure your locks are secure. Make sure your house is warm in the winter and cool in the summer. Don't smoke, it's never too late to give up. Smoking not only rots your brain, lungs and arteries, it's the most common cause of accidental fires. Live in France! Do you know that France has over 10,000 centenarians? For further information on retiring in France, see our article Retirement in Perpignan. Bill Larkworthy (email: william.larkworthy@wanadoo.fr) retired to Provence a few years ago. Fascinated to read your article, some of which I was already aware of, but others coming as quite a surprise. So, my other half and I have decided to follow - fruit for example we have always indulged but only on a "time to time" basis. Dare I say that I feel as fit today as the day we moved to France 7 years ago. We exercise -walking, gardening and I run 6 to 8 kms (not like a bat out of hell). We love travelling. I have a motor cycle and have just bought a motor home. This is a wonderful country, never tire of it. We have lovely French neighbours who take the mickey sometimes out of our French but teach us a lot most of the time. Having said all this (and I could say more) MY best secret is a partner who is 19 years younger than my healthy 72 - such a fortunate man. Best wishes to all.